This year’s South African Fruit campaign in the UK focuses on ‘Doing Good with South African Fruit’. The campaign highlights the exceptional taste, ethical reasons for buying it and the seasonality and exclusive varieties produced. Varieties of apple and pear are available in stores across the UK from April until October, while European fruits are out of season. Hot-spiced chickpeas give this South African apple and pear salad a delicious twist. It contains fruits, veg, nuts and feta to provide your body with a well-balanced, nutritious meal. 1. Toss the South African pear and apple chunks in 1tbsp lemon juice. Set aside. 2. Heat 1tbsp olive oil in a frying pan and add the chickpeas. Cook over a medium heat for 1-2 minutes, then add the almonds, turmeric, chilli flakes and cumin. Cook gently for 2-3 minutes, stirring often. Cool. 3. 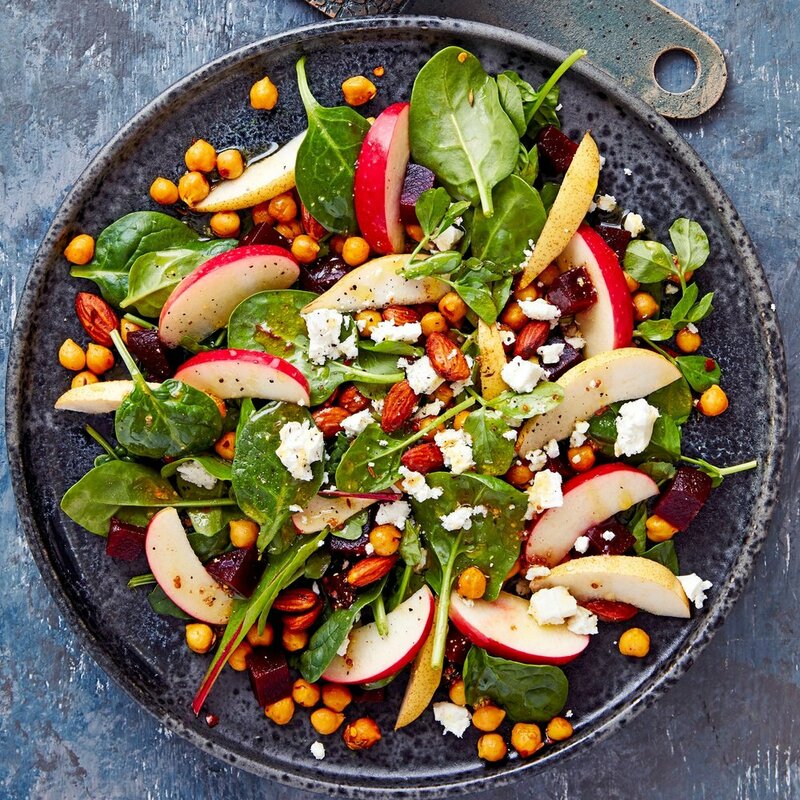 Share the salad leaves, beetroot and chickpea mixture between 2 serving plates and scatter the pear and apple chunks on top. 4. Mix together the remaining olive oil, lemon juice and mustard. Season and drizzle over the salads. Serve, sprinkled with crumbled feta cheese. Cook’s tip: To serve as a vegan meal, replace the feta with some tofu – or just leave it out. South African apples add a subtle sweetness to complement the warm spicy flavours of this slow-cooked chicken dish. It’s budget-friendly – and good for you too! 1. Core and chop the South African apples. Heat the vegetable oil in a flameproof casserole dish and add the chicken thighs. Cook for 4-5 minutes, turning occasionally until browned on both sides (this is important for a good flavour). 2. Add the apples, onion, carrot, celery and red pepper and cook for 2 minutes, then pour in the cider or apple juice and stock. Stir in the coriander, then add the lentils. Cover and cook on the hob over a low heat for 1 hour 15 minutes, or cook in the oven for the same time (preheated to 190°C, Fan Oven 170°C, Gas Mark 5). 3. Just before serving, stir in the chicken gravy granules to thicken. Serve garnished with parsley. This versatile little vegetarian and vegan number is perfect for picnics and light lunches – and it’s healthy too! 1. Core and coarsely grate the apples, then toss them with the lemon juice. Add the cabbage and carrot with 1tbsp olive or walnut oil. Stir in 1tbsp mixed seeds and season with salt and pepper. 2. Rub the remaining oil over the slices of sourdough bread, then char-grill or grill them until lightly browned. 3. Spread the nut butter over the sourdough and top with plenty of coleslaw. Sprinkle with extra black pepper and the remaining seeds. Cook’s tip: Try using hummus instead of nut butter, or for a non-vegan version use soft cheese as an alternative. This wonderful filo tart is topped with thinly sliced South African apples and pears, baked until tender. Try it served with reduced fat crème fraiche on the side. 1. Preheat the oven to 200°C, Fan Oven 180°C, Gas Mark 6. Toss the South African pear and apple slices in the lemon juice. Set aside. 2. Unroll the sheets of filo pastry. Brush a large baking sheet with a little melted low fat spread. Layer the sheets of pastry on top, brushing each one lightly with melted low fat spread. 3. Arrange the fruit on top, scrunching up the edges of the pastry to form a border. Sprinkle the apples and pears with the ground cinnamon or mixed spice and icing sugar. Transfer to the oven and bake for 20-25 minutes, until golden brown. 4. Serve warm, sprinkled with extra icing sugar. Cook’s tip: This delicious tart is perfect for using up excess fruit – making sure that it doesn’t get wasted.